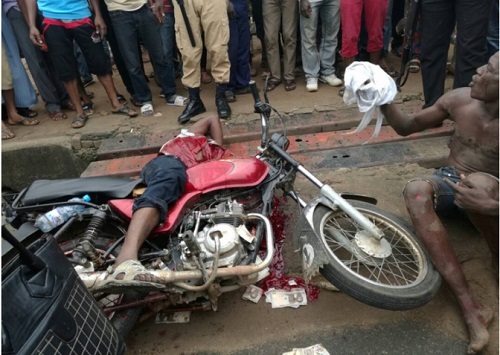 Luck has ran out on a notorious armed robber who was shot dead during a gun battle with policemen after robbing a customer at Zenith Bank Plc branch at Egbeda, Lagos on Wednesday. Gistmania reported that one of the robbers died as a result of injury he sustain in a gun battle with the Police while the second suspect was arrested alive. The police also recovered short locally made gun and live ammunition including the motorcycle they used to operate in Lagos. The duo had attacked a woman identified as Mrs Joyce Bello and snatched N40,000 she withdrew from the Bank ATM. The duo had accosted her and pointed their gun on her head and forced her to surrender the money. After collecting the money, they were pursued by policemen who got hint of the robbery. Eye witness said the suspects were driving one way on the road trying to escape after shooting sporadically to scare people away, unfortunately that was the period Idimu police patrol team were moving round the area on routine check. The policemen shot at the robbers killing one in the process. The corpse of the victim identified as Habib Bello who lived at Shasha area has been recovered and deposited at Igando General Hospital, while the second suspect who resides at Dopemu area was still detained at the Idimu Police Division. This Is How A 'Mother's Nine-months' Ended His Life.Too Hopeless.Criminally Hopeless! Had they succeeded, they'll be making louder noise in bar as if they worked for the money. Poster please what is too bad about killing a notorious arm robber? .....and the money is on the ground.